Looking through the various reviews of A.W. 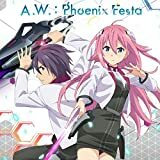 : Phoenix Festa, I get the sense that you’re better served by the game if you’re not going in as a fan of the anime on which it’s based. After all, a lot of the criticisms seem to stem from how it tries to be all things to all people, about how it brings together a few different ideas but then doesn’t do anything with them. I, on the other hand, had never even heard of The Asterisk War prior to this game. Even now, after playing the game and skimming the Wikipedia page, I have only a bare idea of what it’s about. And despite that lack of prior knowledge– or, perhaps, because of it — I actually rather enjoyed the game. It helped, of course, that a major part of the game was simply hacking your way through enemies. In fact, as far as the action bits go, that’s pretty much all there is to it. You have a bunch of conversations, then you can either take on new jobs (all of which involve fighting in some form or another), duel, or get into fights that help advance the story. (There’s also shopping and training, but those both take the form of clicking a button.) Admittedly, the combat does start feeling slightly repetitive after a certain point, but it’s spaced out enough and the fighting styles are varied enough that the certain point takes a long time to be reached. As for those “bunch of conversations”…I think there, too, my lack of familiarity with the anime and the characters proved to be a boon. I had no idea of the back stories involved, so I was able to take them at face value. I may have missed out on some nuances, but otherwise I found them to be surprisingly engaging. The romance aspects never quite did it for me — which, I’ll concede, may be a bit of a failure on the game’s part, seeing as it is part dating sim — but they’re not so in-your-face that you won’t be able to enjoy Phoenix Festa otherwise. And as I said, enjoy it I did. I’m not sizing it up for a spot on my GOTY list or anything, but I’ll still look back on A.W. : Phoenix Festa with no small amount of fondness when it’s all said and done.